Market share equals what to social enterprise? 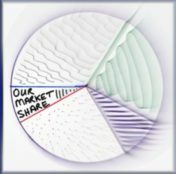 September 19, 2016 / jonathanawade / Comments Off on Market share equals what to social enterprise? One key measurement of success in a for-profit business is market share. Does this also apply to a non-profit housing cooperative? An employment-based catering company? An up-cycling storefront? The goal of a social enterprise is to maximize the positive impact on those who benefit from their business: affordable housing to all, new job opportunities for the disenfranchised, tons of diverted waste from landfills. In many cases, mission maximization can only be achieved by increasing the scale of their business; therefore, unless the market expands, scaling up means someone else must scale down or be joined. However, it is almost “un-social enterprise” to be creating a vision in which market share is a goal, or eve n plausible. Most social enterprises operate locally, and all work with a social mission that drives them. The thought of putting a for-profit out of business—or even acquiring that company—is likely not in their initial thinking, nor explicitly in their business plan. But why not? Why shouldn’t a social enterprise seek to minimize competition and/or take customers from another local business? Why wouldn’t they attempt to buy that local business in order to increase their inventory, maximize their social mission, minimize competition, and benefit from economies of scale? There is no imperative to leave your competitors alone when you are a social enterprise. Of course, it is possible that putting competitors out of business, or challenging their cost structure by using grants to get a competitive advantage, or taking them over in order to employ a disadvantaged segment rather than their existing employees, may have unintended social costs. No social enterprise ought to decrease the employment of others in favor of their “target” population, or diminish the value of for-profit colleagues in the marketplace. Healthy competition is good, arguably even necessary for innovation and improved social outcomes, and seeking market share without recognizing the social costs could potentially jeopardize the net social impact on the community. Social enterprises are modest by nature, in my experience, and aggressive business practices are seen as unsavoury at best and downright nauseating at worst. However, if increased market share means increased (net) social benefit, then by all means a social enterprise ought to be unabashedly bold in their business aspirations to increase market share.